The name of the famous local brand of beer, Hinano, discreetly inscribed on the bottom. The dominant tone, gray and black, is still bright due of the different contrasts. In Tahitian langage, pareu (pronounced paré-ou) means pagne. As time goes by, it became paréo which is easier to pronounce for foreigners. 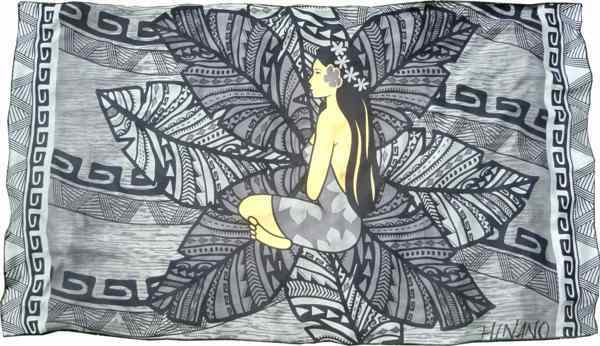 In Tahiti and her islands, it is customary to wear the pareo as cloth, for both women and men. Each adjusts it in its own way: wrapped around the waist or knowingly forged around the neck, shoulders and hips, the pareo can be a real wear (loincloth, short, short skirt, long skirt or held more elegant). You will find many ways to tie a pareo in the guide "How to wear a pareo".